Boasting tough-as-nails die-cast aluminium construction throughout, a grade 304 stainless steel wormshaft for theultimate in reliability and durability and with sophisticated electronics for smooth, safe operation, VANTAGE gives you everything you need to swing the future your way. When it comes to your home's security, you want real muscle, and with its tough die-cast aluminium armour and powerful piston-driven operation, nothing packs more of a punch than VANTAGE. In addition, the VANTAGE's fully-sealed construction with custom-moulded seals ensures that it's as good at shrugging off the elements as it is at keeping criminals out. Beef up security! Fit a VANTAGE! The VANTAGE's advanced internal limit system guarantees very reliable operation and precise control of the movement of the gate. It is designed to provide precision position information to the controller, resulting in unparalleled reliability and setting the standard in early collision detection. The VANTAGE electronics, with 'Quadra-Drive' speed control, maintains smooth and quiet starting and stopping of the gate regardless of its condition and ambient temperatures, even after many years of service. The state of the art control reduces the operating stresses and extends the life of both the operator and the gate. 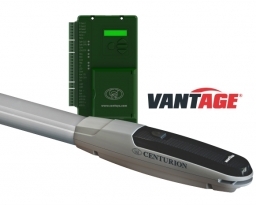 The VANTAGE controller accurately monitors any obstructions to the movement of the gate and ensuresultra-safe operation against crushing and provides end-user peace of mind.